As we learnt from its most recent quarterly financial reports, and post results investor call, Nvidia has been investing heavily in implementing in-car technology with good returns. We heard that "automakers are using Tegra to help reinvent the driving experience," and sales of Tegra based car infotainment systems doubled in the year leading up to those results. Now Nvidia is showing that it will keep up the in-car momentum with a new official blog post about its collaboration with Audi. 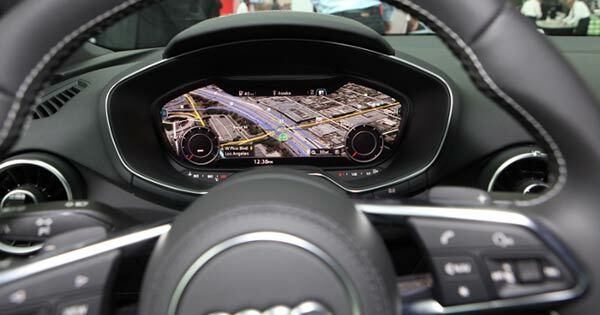 Yesterday at the Los Angeles Auto Show's Connected Car Expo the pair showcased the all-new Audi TT with a virtual cockpit powered by a pair of Nvidia Tegra 3 processors. We've reported on this previously on HEXUS, but Nvidia has now provided more information on the system and how it is going to develop. In the Audi TT, the in-car Tegra 3 MMX system powers the infotainment and sat nav functions and the other Tegra 3 processor powers the TT's 12.3-inch TFT instrument panel (AKA Virtual Cockpit) which runs at up to 60fps for smooth panel instrument animation. Nvidia explains that the MMX systems are upgradeable - so cars can get upgraded with new processors and tech capabilities as they become available. Nvidia says that the new Audi A6 and A7 sports sedans feature the latest version of the MMX, upgraded with a Tegra 3 processor. With this upgradeability it is claimed that Audi in-car tech is now leading the industry with a two-year upgrade cycle compared to most rival automaker's five to seven years cycle. 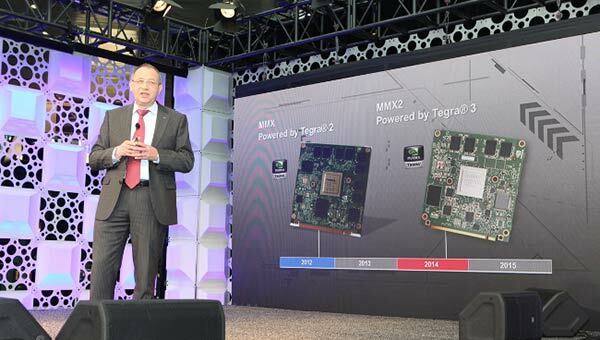 Looking ahead Nvidia promises more, thanks to its recent Tegra K1 processor and the abilities that stem from its computing power. We are told that "the K1 will be at the heart of the Audi zFAS central computing module that will manage the semi-autonomous driving features". It also announced yesterday, at the LAAS Connected Car Expo, that Audi's "Piloted Driving capability has been approved for production in the coming years due to the success they have had testing the NVIDIA-powered computing system." Do readers see this flood of technology into cars as welcome? Or are you perhaps in the camp that is still suspicious about the sorcery embodied by the automatic gearbox? Good that they're allowing upgrades to the cars as technology advances - not like the kit of old that got just that - old! Spend thirty grand on a car and get a tegra 3? Thanks. Whilst the current (new TT) offering isn't that exciting - its the potential of getting a “good” technology innovator involved that is. For years and years car infomat systems have been 5+ years behind the times, and its only recently that we've started getting innovative things like heads up displays etc in cars. The fact that most in car sat navs (including BMW/Audi/Jag) are vastly inferior to a £50 tom tom speaks volumes! Personally I think big TFT type screens (as in the new TT) are a bit out of date now and not needed - the new laser HUD systems that are being introduced on cars like the new Jaguar XE is much more exciting and futuristic, and I think thats the direction we'll be heading….HUDs which head more in the holographic direction than big old fashioned screens. Still the more innovation we have here the better, I must admit that I love my gadgets in my cars. I can't wait for the XE to arrive as it's chock full of toys..crazy impressive for a sub £30k car.